Experience more than just the classic African safari! 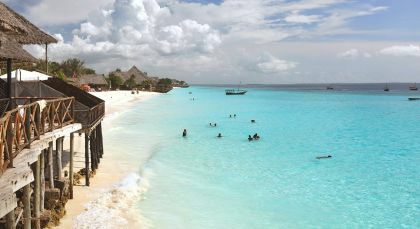 With the combination of wildlife in the Serengeti, cultural encounters in Stone Town, and relaxation on the beaches of Zanzibar, you’ll love the variety of this private Tanzania tour. With commanding views of magnificent Mount Kilimanjaro, Arusha is nestled in the shadow of Mount Meru, and an ideal launchpad to reach the country’s most renowned game reserves. Witness tree climbing lions, a rare sight if ever there was one, at northern Tanzania’s Manyara National Park. Manyara National Park occupies a vast area, spread over 330 square kilometers, and has a lake covering 200 square kilometers of this area. Explore the landscape and the rich flora and fauna at the park. Marvel at the African elephant, a zebra, or a majestic cheetah in pursuit of prey. Also train your sights on giraffes, impalas, baboons, buffaloes and monkeys. Observe flamingos, hippos and crocodiles at the lake habitat. Enjoy some bird watching and catch cormorants and storks in flight. The months between July and October mark the dry season that is ideal for spotting mammals. Visit between November and June for birdwatching. Drive down to the Ngorongoro Crater floor, with some of the most fertile and richest grazing grounds in Africa that has in turn engendered one of the highest density of top predators in the continent! 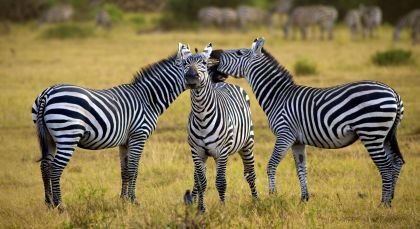 Expect some of the best game viewing opportunities here, with herds of zebras, wildebeests, large prides of lions, hyenas and rhinos, among many more animals and birds. 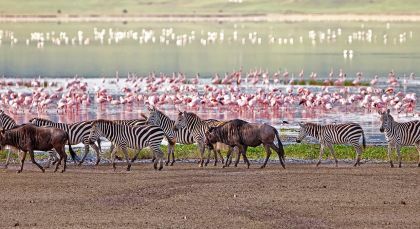 Experience breath-taking sightings of massive herds of wildlife set against the volcanic crater and surrounding highlands of Ngorongoro. 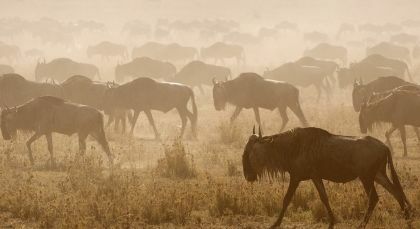 Enjoy thrilling game drives in this Unesco World Heritage Site, awash in otherworldly aqua shades. Break for a much deserved picnic lunch amid a magical landscape. Relish a generous and scrumptious luncheon spread, before heading back. (Half Day; Time of Day: Morning; Meal included: Picnic lunch; Fitness Level: Easy; Please bring sunscreen, sunglasses, hats, binoculars and don’t forget your cameras). Stone Town is a place of winding alleys, bustling bazaars, mosques and grand houses, whose original owners competed with each other over the extravagance of their dwellings, reflected in the beautiful brass-studded and carved wooden doors. 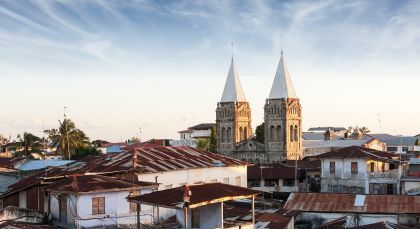 Discover Zanzibar’s Stone Town on this fascinating walking tour. Take a leisurely, three hour long walk through the winding streets of the old city, admiring the heritage buildings, distinctive architecture and places of interest. Walk over to the ramparts of the Old Fort facing the waterfront. It was built by the Arabs in the 17th Century when they took over the island from the Portuguese. Visit the imposing Beit el-Sahel or Palace Museum nearby, reconstructed from the ruins of Sultan Seyyid Said’s 19th Century royal residence. Stop by East Africa’s first Anglican Cathedral and the formal Forodhani Gardens to get a taste of the district. Amble along the historic alleyways, passing by latticed balconies and carved doorways from another era! Shop for spices and exquisite artifacts at Zanzibar’s famed bazaars, bargaining to your heart’s content. Discover the vibrant Zanzibar Night Market! Watch the marvel of the transformation of this part of Zanzibar from a peaceful, slow paced area by day into a busy market by night. After sunset, the once quiet streets at the heart of Stone Town transform into a culinary playground. Chefs set up countless rows of food tables as hundreds of people stream in to add to the marvel. The tables are laden with Zanzibari pizza, huge falafels, sugar cane juice, enormous samosas, coconut bread, fresh seafood skewers and crepes laden with chocolate syrup. Join in the activities, sampling various mouth watering delicacies and get to hear of the inspiring stories behind the creative cuisine. Here, culture meets history, as you experience the heritage of Zanzibar as a bustling trading hub through its vibrant, delicious cuisine. 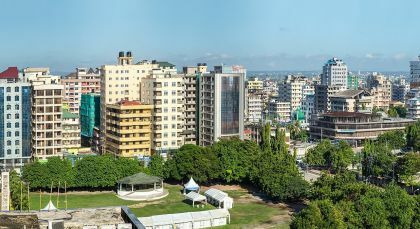 Located in a quiet bay off the Indian Ocean coast, Dar es Salaam is the main port in Tanzania and has a bustling harbor. From the very first contact with Enchanting Travels to the completion of our trip, our experience has been outstanding in every way. 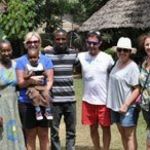 Thanks to the professional and friendly manner in which we were dealt with by all involved, and the fabulous experience we had whilst in Tanzania, we have no hesitation in highly recommending Enchanting Travels.